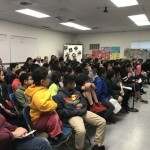 More than 100 parents, students and civic leaders attended a presentation of fourth and fifth grade art at Laurel Dell Elementary School in San Rafael. 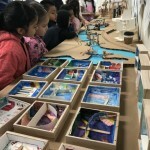 Through an innovative partnership between Youth in Arts, UC Berkeley’s Y-PLAN and the California Arts Council, mentor teachers taught a 12-week course that explored the fascinating relationship between art and architecture. 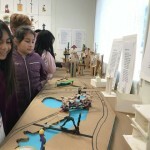 It was a wonderful way to introduce students to the field of architecture. Group Reflection: What do you see? 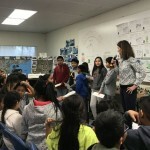 Visiting architects who generously participated were led by architects and educators Shirl Buss of UC Berkeley’s Y-PLAN and Janine Lovejoy Wilford, who taught fifth graders how to measure, design and build. 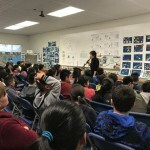 Other architects who worked with the classes were Sally Dominguez and Dustin Foster. 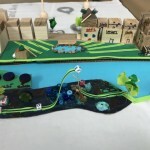 Fifth graders worked hard to contributed to San Rafael’s 2040 plan, trying to imagine a city of the future and what sort of bridges it will need. 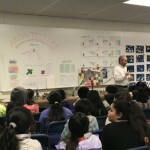 We looked at pressing issues such as climate change and the need for affordable housing. We looked at the Canal Community, where many of them live. 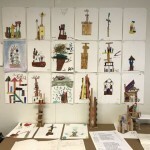 Fourth graders engaged in a variety of projects, such as building Towers of Power using wood scraps and found objects and tiny bridges in a box. 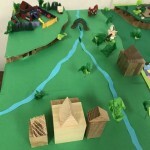 Throughout the course we refined our design skills along with practicing cutting, measuring and designing for small spaces. 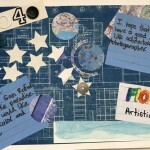 Using symbols, we bridged our current selves with ourselves and dreams of the future. 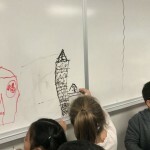 Students also made beautiful paintings of their towers and worked collaboratively to bridge them together. 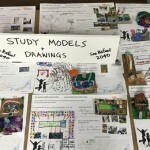 Often students worked in their sketchbooks, designing projects before construction.